The canvas bin holds scarves and gloves and various winter-wear. The other items include a few tablecloths that will slowly find a new home (can't wait for our linen closet in our renovated second bathroom down the road!) and 2 pull out drawers from our kitchen cabinets we didn't end up needing. I'm sure I can find a more suitable place for those in our storage area. 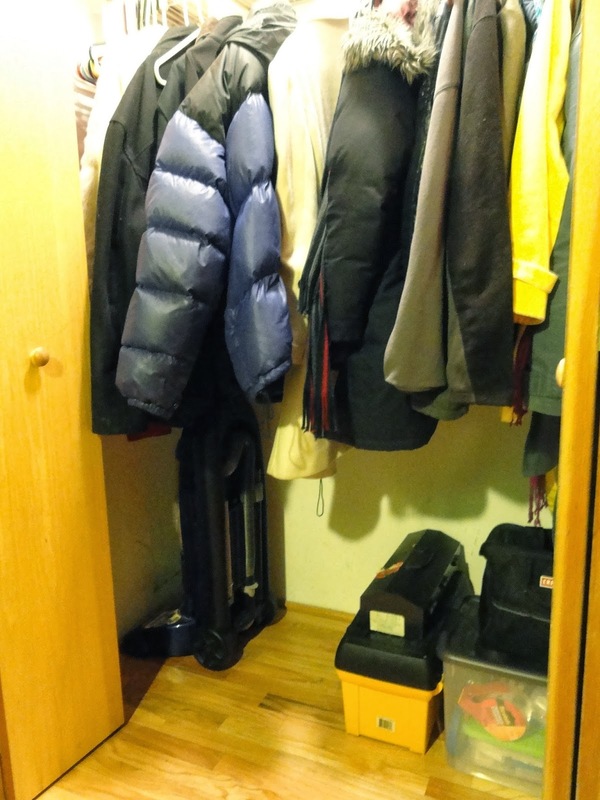 We took some time to go through everything on the floor of the coat closet and discovered just how much we had accumulated in our tool/junk boxes over the last couple years. 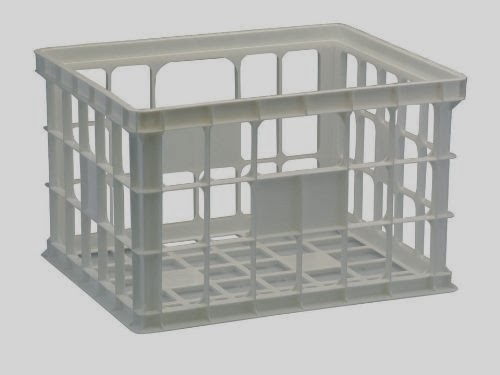 Weeks earlier I had started this clear out process of the coat closet floor by getting rid of two plastic crates that were taking up tons of room and weren't really serving much purpose. It was a little bittersweet. I bought the crates my freshman year of college and for years they served as my poor man's nightstand, with one stacked on the other and a scarf draped over the top. This was my humble attempt at decor at age 19. Bob took this one on last Saturday afternoon. We also pulled out a bin from our media center that held tons of cords, plugs and electronic stuff. As usual, the cats did their fair share of helping organize. I had an extra plastic bin handy, so we replaced the cardboard box that had somehow survived the last two moves and purged the wiring that no longer worked, the chargers that had nothing to charge and a bunch of old or expired home repair items. The bin now sits on the closet floor and holds a smaller plastic shoebox sized bin containing screws, nails and all that DIY goodness, flashlights and batteries, tape, spackle and sandpaper and much more. Better than a cardboard box. Besides the toolboxes, our drills and this bin, the only other thing we needed to make room for was the vacuum cleaner. It's much more accessible than it used to be, though that hasn't made the prospect of vacuuming any more exciting to me. . . 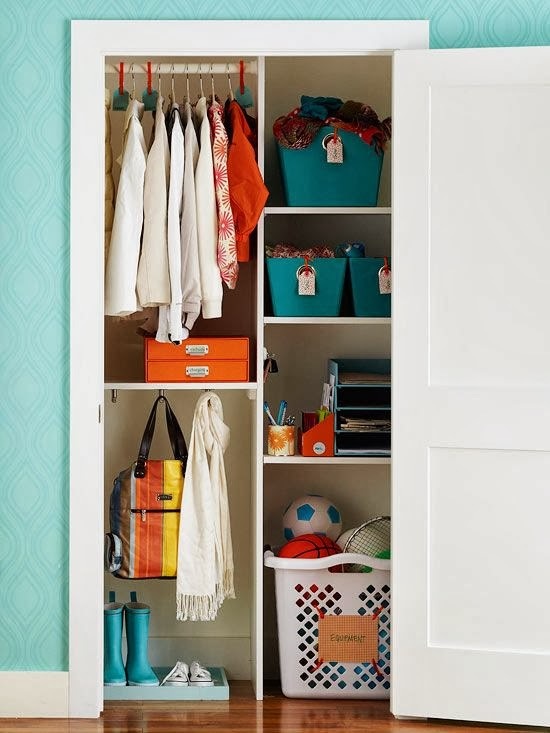 I must be on an elfa roll after finishing our laundry room because I love the idea of maximizing the space in this closet even more. We could easily pack away our winter coats in the summer and spring coats in the winter to give us half of the space back for vertical shelving. 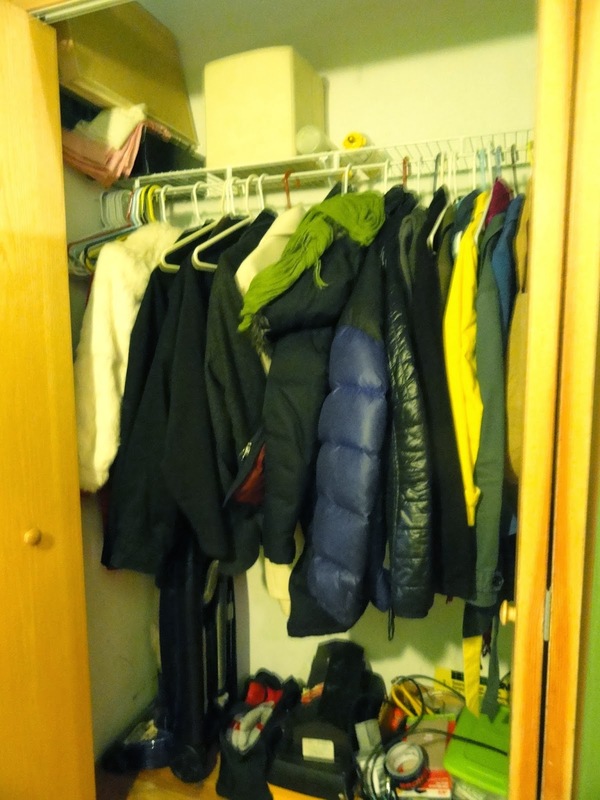 As it is, Bob and I are neck and neck with 10 coats each hanging up. We also have all our our reusable grocery bags hanging from a few hangers at the end. 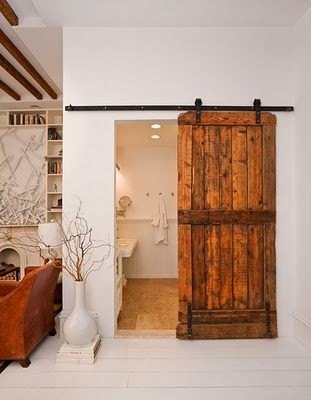 Long term though, we'd love to remove those goofy accordion doors and put a barn door entrance to the closet. 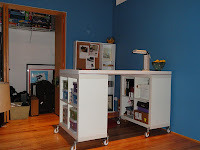 We certainly have the wall space on the one side of the closet to do this and an attractive door could double as "art." That big green wall is just too large for any of our pieces we've tried to find homes for so it remains blank and expansive. I better not get ahead of myself. . .that project may need to wait it's turn until 2015. . . It's a big relief that there is no such thing as a "closet police" , because they would definitely arrest me! My closet is a really big mess !